The new addition at the Montrose Crossing shopping center just inked its final tenant. 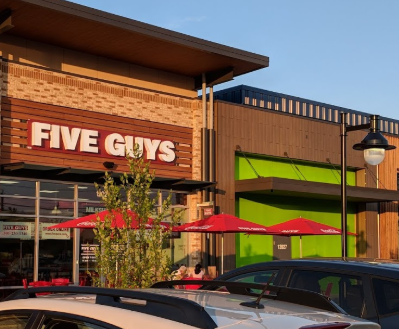 Seattle-based MOD Pizza will take the last open space between Five Guys and the new AT&T Store facing Rockville Pike. MOD already has a Silver Spring location, arriving in Montgomery County during that initial wave of "fast-fired" personal pizza chains a few years back. But it's a pretty strong addition in this spot, because it will be the only pizzeria at Montrose Crossing, and there isn't much fast casual pizza competition within walking distance besides &pizza at Pike & Rose. Expect a thin crust due to the fast baking time in the 800 degree pizza oven, but also expect to pay one flat price for unlimited toppings of your choice, always a good deal. You can also get milkshakes at MOD, fairly unusual for a pizza joint. The chain is celebrating its tenth anniversary this year. Another tenant FRT should have brought to RTS instead. Would you consider Cici's Pizza competition? It's within an easy walk. FRT can't force a merchant to open in any of its locations if the don't want to be there. I didn't say "force," genius. But if you knew anything about commercial real estate you'd know that landlords absolutely have a hand in the makeup of their retail tenant roster. If FRT wanted to induce and attract more fast casual spots to RTS they absolutely could do so.